One of my biggest pet peeves–I mean the one that really gets under my skin and causes smoke to blow out of my ears–is the sticker residue left behind from price tags! It is so frustrating to buy a picture frame only to have thick sticker residue left behind right in the middle of the glass cover! Arg! The only thing I’ve found to make the process of getting it off not so daunting is Goo Gone, but it’s unfortunate how much that stuff stinks. The entire house smells like gasoline when I’m done, not to mention you can never find the stuff when you need it. 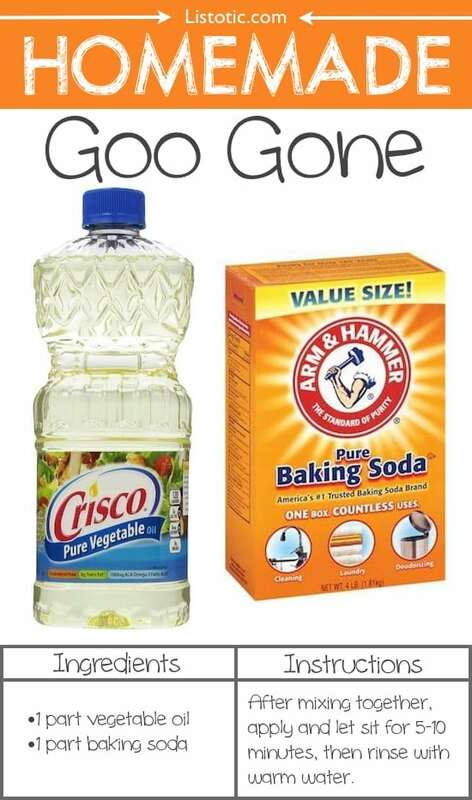 In a pinch, try mixing together vegetable oil and baking soda. The oil helps lift the sticky residue and the baking soda assists by making it abrasive. For a thicker paste, add a little more baking soda until you get the consistency you want. Duh, right?! I’ve never really thought about it before, but detangle spray is really just watered down conditioner (the cheap conditioners actually work better because they are usually not as concentrated). You can make a bottle of this stuff for less than a quarter! 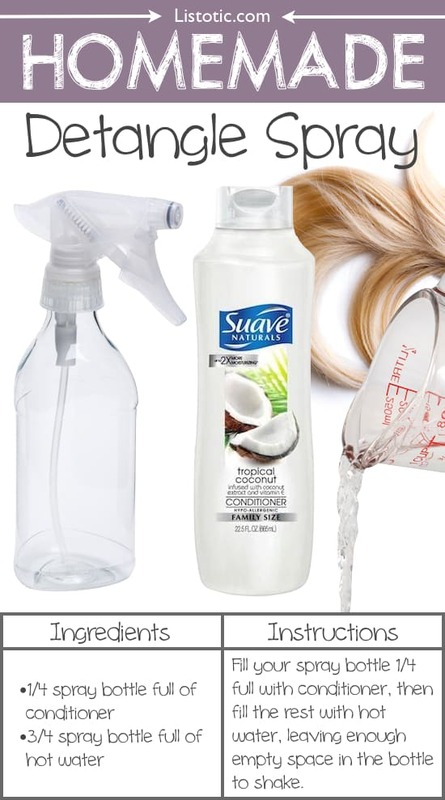 Fill a good quality spray bottle about 1/4 full of conditioner (even less if you’re using a more expensive brand or a thicker hair mask), and the rest with hot water. To get it mixed really well, only fill the bottle about half full of water, give it a good shake, fill the remaining space with more hot water, and then label it with tape or something a little nicer like these. To prevent swimmer’s ear, put about 4 drops of this homemade ear drop solution (1 part vinegar to 1 part alcohol) in each ear after a day in the water. 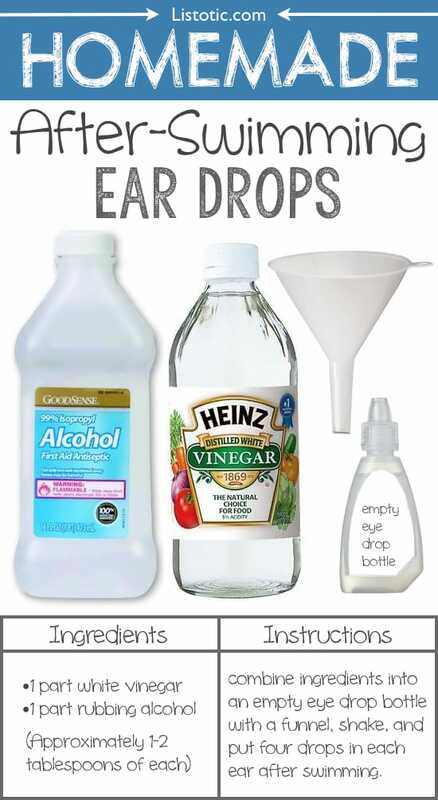 This is not for use if you already have an existing ear infection– the alcohol simply helps dry out your ears while the vinegar helps combat the build-up of bacteria. 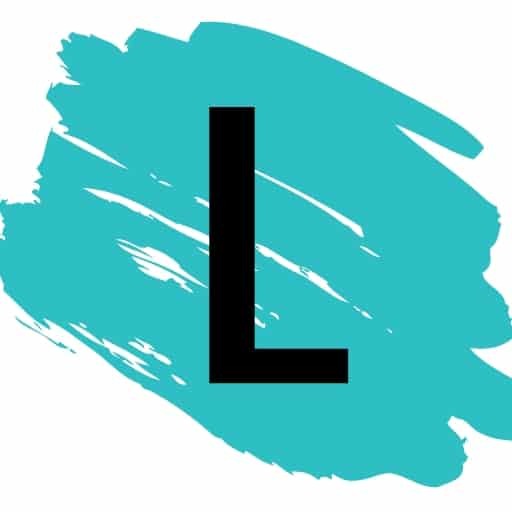 For more information, check out this article here.